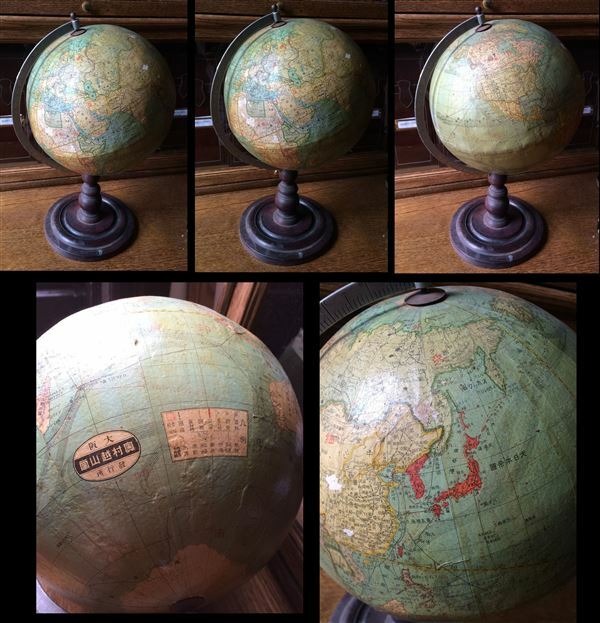 This is a beautiful 1940s vintage Japanese world globe made by Okumura of Osaka, Japan. Made before World War II, this globe represents the entire world on a three-dimensional scale mode of the Earth. Notes cities, rivers, lakes, railways, shipping lines, mountains and a host of other topographical features throughout. Includes a legend and name of creator near the bottom. Mounted at a 23.5 degree angle on meridian, it represents the angle of the planet in relation to the Sun and the spin of the planet, making it easy to visualize how days and seasons change. Has a beautiful wooden base. All text is in Japanese. Good condition. Typical age wear. Tiny portions of the map have chipped, over Africa, France, China, Russia, Pacific Ocean and Atlantic Ocean. Minor spotting.